Text: mina. 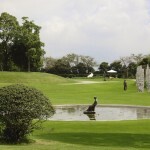 The Museum, designed by contemporary artist Hiroshi Sugimoto, is arranged like a modern stone chamber resembling ancient burial mounds and tomb chambers. There is also a stone chamber, which particularly signifies the modern museum’s similarity to ancient treasure chambers or tombs. The Sugi-koke (haircap moss) growing around the base of this chamber seems to symbolize Mr. Sugimoto. The Museum’s entrance ceiling is built a little low to emphasize the feeling of entering a different environment, similar to doorways in Japanese tearooms. 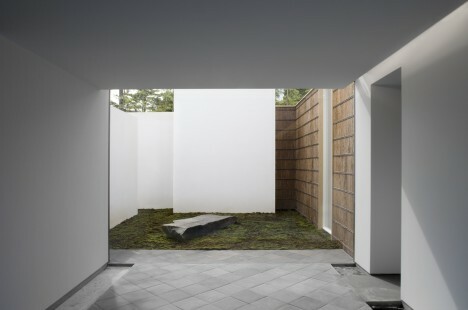 The slanted cut of one of the walls is another design decision that was made in order to create a shadow effect, and to make the space appear larger. The rest area beyond this room looks out onto the koba-zumi style stone wall. 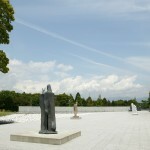 The stone walls located on the right-hand side of the entrance and the rest area (by the far end of the Museum) use the koba-zumi style of stone piling with Nefukawa stones from Odawara. For its stone floors, kawara roof tiles are laid out. Hiba cypress wood said to be 800 to 1,000-years-old is used for the bookshelves in the Museum Shop NOHARA, which carries photography-related books, and for the wood protecting the Museum’s glass surfaces. The triangular glass used to support the Hiba wood is actually an optical glass used for camera lenses. These materials were chosen for their transparency and strength, but Mr. Sugimoto also considers use of old supplies an innovative move. 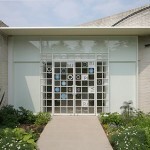 This revival of outdated materials is also the New Material Research Laboratory’s architectural approach. 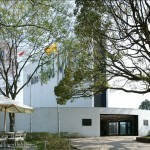 The Museum is 25 minutes by a free shuttle bus from Mishima Station. Located at the base of Mt. 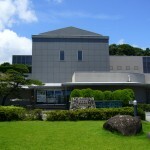 Fuji, the IZU PHOTO MUSEUM is part of Clematis no Oka, which is a multi-cultural facility with museums, restaurants, and gardens. 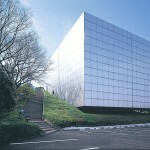 This new, unique art space deserves a trip out to Shizuoka prefecture.